[Updated 2016] Mexico is one of those places that is always a great value for travelers with Euros in their pockets. Hence, we've added it to our Top 10 Value Destinations for Euro Travelers for 2016. It's also on our Top 10 Value Destinations for Australian Dollar Travelers. Don't wait! In a country that is almost three times the size of Texas, Mexico is best defined by its geographical diversity. Rocky desert, humid jungle, breath-challenging elevations, eye-widening canyons, and manicured coastal stretches mean that visitors can satisfy any activity craving they have. Street food stalls and makeshift restaurants serve traditional recipes that will leave you questioning the quality of even the finest Mexican food back home and will feed you beyond full for as little as a few dollars. Flavors and dishes vary from state to state making a culinary tour the perfect theme for your visit. With super friendly people, a tranquilo attitude, and some of the clearest Spanish spoken, Mexico is the perfect place to learn español. Basic English is also spoken in most areas, meaning you can get help whenever you’re stuck. Despite its vast size, Mexico has an excellent bus network as well as competitively priced internal flights making it easy and cheap to get around. Add an extensive choice of hostels and you’ll realize Mexico is perfectly set up for indie travelers working to a tight budget. Take your yoga mat, meditation mantras, or a good book to Palenque. As one of the less frequented ancient Maya sites, people use this space as they might an ordinary park but with some pretty extraordinary ruins as a backdrop. See past the tourism in the Caribbean resort town of Cancun. Pass over the Hotel Zone in favor of downtown where you can join the locals for al fresco dining from the food stalls that surround Parque de las Palapas. Witness a blend of old and new in Mexico City. The Centro Histórico and impressive Aztec pyramids of Teotihuacan will take you back in time while the contemporary culture of Zona Rosa will drag you back to the 21st century. Visit the town of Tequila in Jalisco before the tourist hoards take over - Tequila brand Jose Cuervo has pledged to invest $25 million to turn this dusty town into Mexico’s hottest tourist destination in the next few years. Sit in Plaza de los Mariachis in Guadalajara and watch these talented bands compete for attention (and tips). This isn’t a performance put on for foreign tourists. It’s woven deep into Mexico’s fiesta culture. Check out our Mexico correspondent, Jo Fitzsimon's, extremely thorough guide to travel in the Yucatan area of Mexico. The most in depth guide I've seen for independent travelers coming to this region. Your thoughts before traveling to Mexico might include "Should I go?" but after any time in this country you’ll quickly come to wonder, "Do I have to leave?" Mexico has enough to occupy a year-long stay, so the best advice for first time travelers and anyone on a shorter stay is to give some thought to what you want to experience while you’re there. Rainforests, desert, Caribbean seas, Pacific-side surf towns, Spanish Colonial cities, the remnants of ancient civilizations, a peninsula of paradise, and a capital city that is packed with cultural enticements and seems to sprawl to eternity will all keep you busy. Otherwise, just let your time whistle past as you languish sloth-like on icing sugar sands. 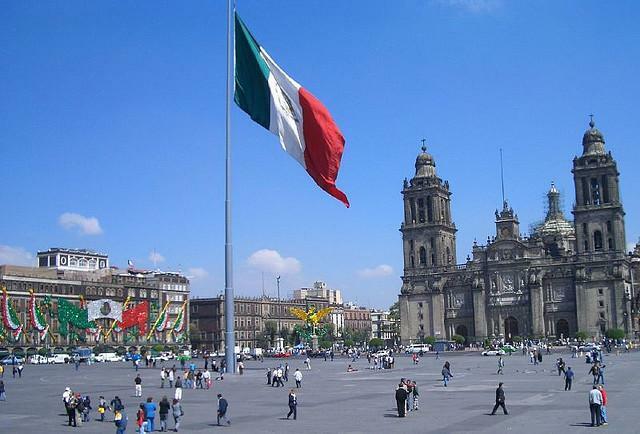 The giant capital of Mexico City is one of the finest colonial destinations in Latin America. The Centro Historico district is a UNESCO World Heritage Site as well as the most popular place to stay for budget travelers. Tijuana is a classic border town just south of San Diego. People flood into the city every day for bargains on crafts and jewelry, and the nightlife can be wild and unpredictable. Cancun is the largest beach resort on the Caribbean side. The city didn't even exist until it was purpose-built starting in 1970 and now it's a popular Spring Break spot for Americans, but also popular all winter as well. Puerto Vallarta, Acapulco, Mazatlan, and Cabo San Lucas are the main Pacific resorts and popular among cruise ship passengers as well. For more in depth information on what to see and do in Mexico, check out the Mexico section of How to Plan an Extended Trip in Central America. There are many large airports in Mexico and the distances between cities are great. You should either fly into Mexico City or get a flight into Cancun if you are headed for that resort of the ancient Aztec ruins of the area. You can also fly into all the Pacific resorts from Los Angeles and other major nearby cities. For more information on getting around in Mexico, read the transport section of How to Plan an Extended Trip in Central America. Obviously there are countless hotels in Mexico, and they come in all price ranges. There are loads of international-quality chains in Mexico City and the resort areas, and budget hotels throughout the country as well. There are quite a few hostels in Mexico, mostly in the capital, but there are a few in other cities as well. Cities with no hostels tend to have cheap hotels so the entire country is budget-friendly. Jo Fitzsimons, author of this page, has traveled through Mexico twice in the past two years, staying longer than intended each time. During her last trip she meant to visit for a month but ended up staying for five. She’s seen the east, the west, south, and part of the north, but will be returning as there is still so much of this vast, amazing country to explore. Jo is a former lawyer turned freelance travel writer with her head in the clouds and her feet in the sand. Although she is originally from England, home these days is wherever she lays her backpack. When Jo isn’t racing around the world and embroiling herself in misadventure, steam can be found flying off her keyboard as she tries to get her travel experiences immortalized into words. For Jo’s travel adventures, inspiration and advice, check out her blog Indiana Jo.